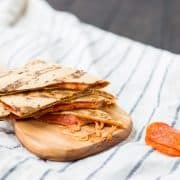 I love to throw a pizza quesadilla on the grill for the kids when I’m grilling other things, but this pizza quesadilla makes a great quick lunch too! Any besides me have picky eaters in the family? My daughter, E, was always such a great eater. She’d eat anything I put in front of her. Then along came brother. The picky one. He’s been picky from day one. I know there are people out there that think picky eating is the fault of the parent, but I always put in front of him what we’re eating. “Oh they won’t starve themselves, they’ll eat it eventually.” Not my stubborn kid, he’d happily starve himself before eating most things. Couple this with a few tricky food allergies, and we have ourselves a headache. So I have found myself making him something different than what we’re having. You say a lot of things before becoming a parent and in the early stages of parents, but sometimes you just gotta go with the flow. He still has to try whatever we’re having, and he has to eat at least one bite of it, but there’s always also something on his plate that he’s going to eat. Poor kid gets deprived of cake and cookies at most parties because of his allergies, I’m not going to starve him every night at dinner. I’m just not going to. I never go too crazy making something fancy for him, and I’m definitely not a short order cook. Sometimes he’ll eat half of his grilled cheese or whatever and ask for something else. Nope, this is food you like, and we’re not throwing it away to turn around and get out different food. I used to be a very picky eater too and now I’ll try just about anything, so I have hope for him. There’s a point to this story. I know I’m not the only one fighting this battle every night (and every afternoon and morning). Let’s say, for example, that we’re having grilled chicken for dinner. 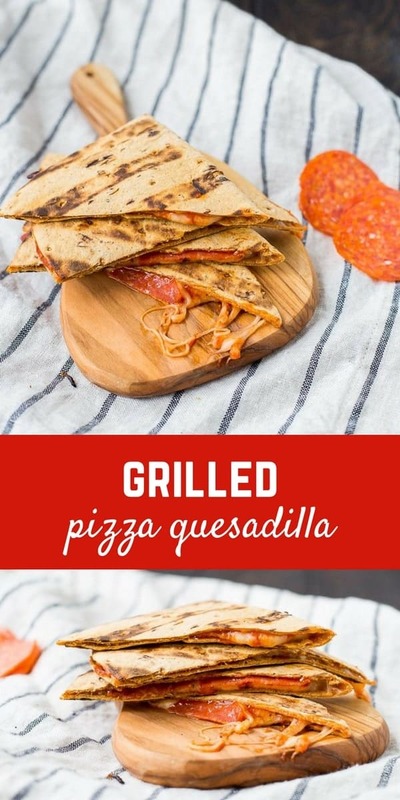 Well, I certainly don’t want to get any extra pans dirty or make myself work too hard, and that’s where this pizza quesadilla comes in. Throw it on the grill the last two minutes of the chicken’s cooking time and BAM, dinner for the kids is DONE. Or, it also works great as a quick lunch for grown-ups, too. Or as a side to that tasty chicken. And you can fill them with anything — anything you’d top a normal pizza with. I kept it classic with pepperoni and cheese and pizza sauce. 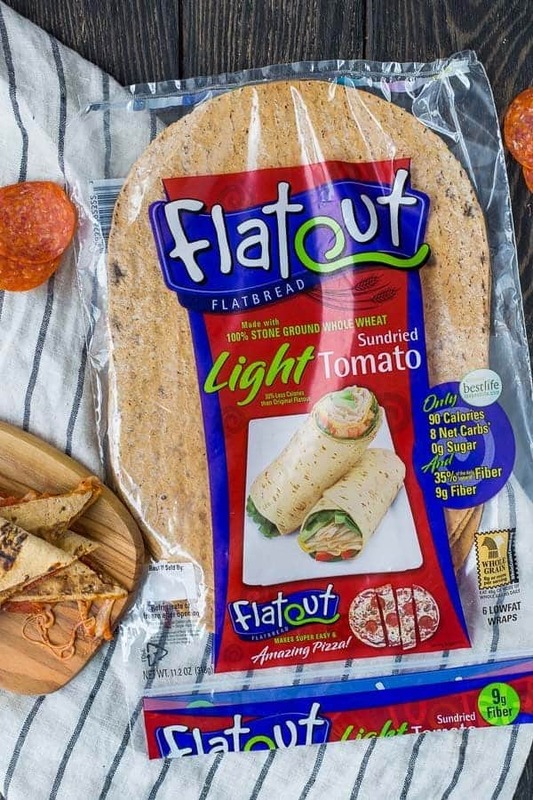 I did take the flavors up a notch by using Flatout’s Sundried Tomato flatbread. It adds a great layer of yummy tomato flavor in addition to the delicious smoky flavor the grill adds. Heat grill to medium high heat (400 degrees Fahrenheit). 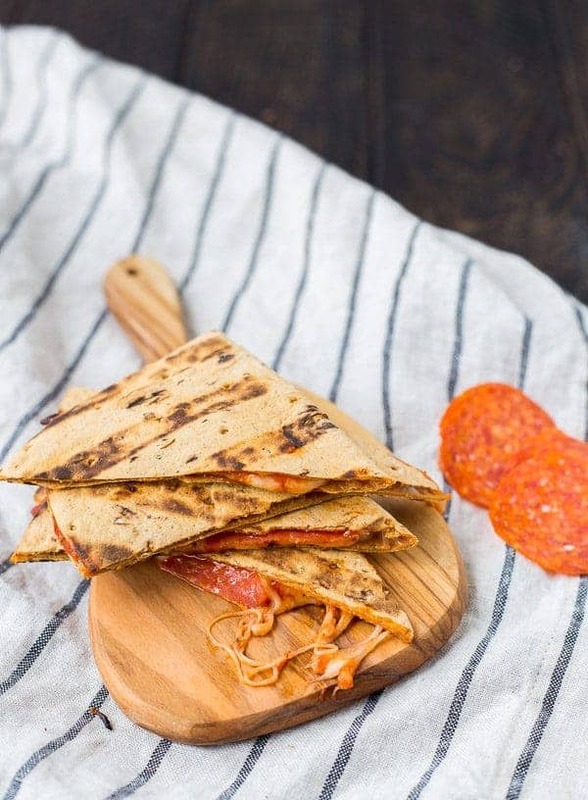 Lay Flatout Light Sundried Tomato Flatbread on countertop and spread half with pizza sauce. 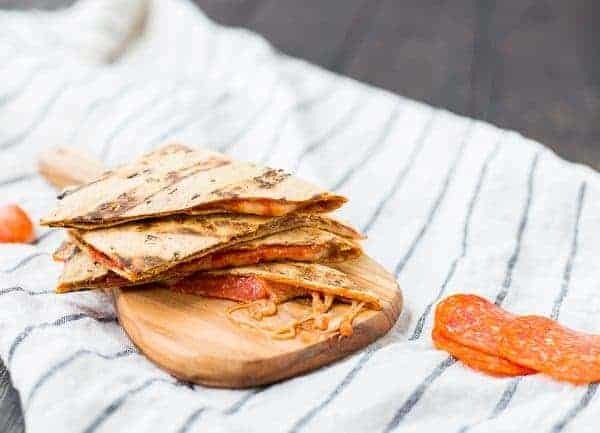 Top with cheese and pepperoni and fold in half. Carefully place on grill and grill for 1 minute on each side or until crisp on outside and cheese melts on the inside. 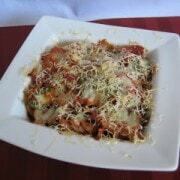 You can add any pizza fillings you like! 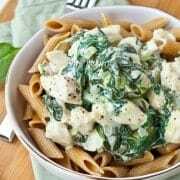 If you don’t want raw vegetables in your quesadill, give them a quick saute in a pan to soften before adding as this isn’t on the grill long enough for vegetables to cook. Verdict: Such a great lunch or snack – my kids love these too! Husband’s take: He gobbled these down! 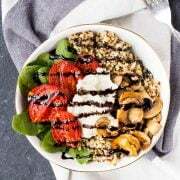 Changes I would make: None are necessary but have fun with toppings! Difficulty: So easy and so quick! 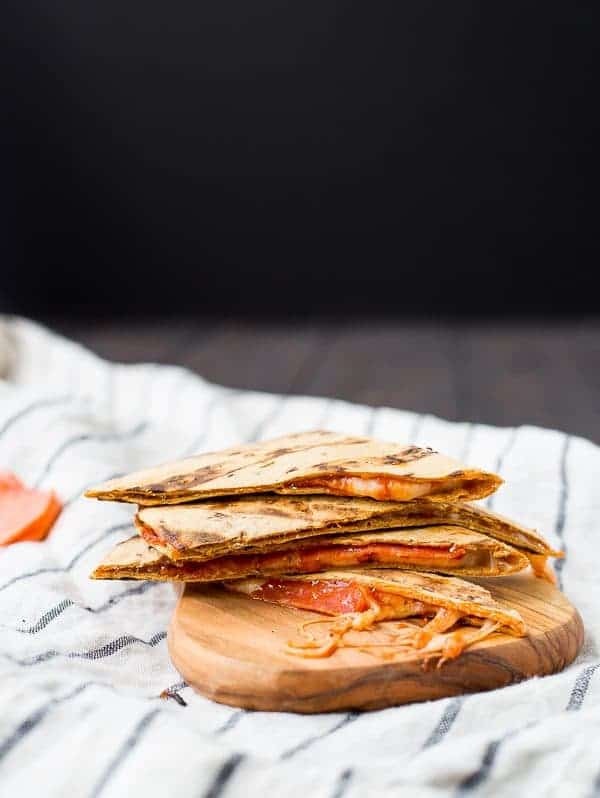 Disclosure: I’m excited to partner with Flatout Flatbread to bring you quick and delicious recipes like this pizza quesadilla. I have been compensated for my time but all opinions are always my own. Thank you for supporting Rachel Cooks by reading about brands we love and use in our own home.